Metaphysics might be even more important than I thought. I discovered metaphysics when I was searching for a way to bring all of my varied interests and passions under "one roof" so to speak. Metaphysics is the study of the nature of reality. So I knew it was an all encompassing and valuable subject to explore. You can read about the importance of philosophy at Metaphysics for Life . As the years have gone by, and my knowledge and experience expands, I am beginning to get a hint at just how important - perhaps even critical - metaphysics might be to the survival of humanity on this planet. Remember, when I say "metaphysics", I am talking about the STUDY of the nature of REALITY. David Suzuki says, "Economics is so fundamentally disconnected from the real world, it is destructive." "Pro-Future Evangelist" Michael Dowd says that " Reality reconciles science and religion. " What all of these have in common is the IMPORTANCE of understanding the true nature of our reality. Over time, the word "metaphysics" has become associated with new age philosophy and is often dismissed as "woo woo" "too deep" or "esoteric". But nothing could be further from the truth! So far, I have found no other study (and metaphysics is a VERB, not a noun) that encompasses ALL areas of life here on Earth. Science, philosophy, religion, spirituality, health, psychology - there is no category that escapes the realm of physical reality. Not even spirituality. Which is the awareness that every"thing" is connected. It's real. I am telling you this now because I want to encourage you. As a student of metaphysics you are on the cutting edge. Even though it's a "subject" that has been around for thousands of years. Understanding the nature of reality, in very real and tangible terms, might be the only hope for the survival of humanity. Many think it will be science and technology. 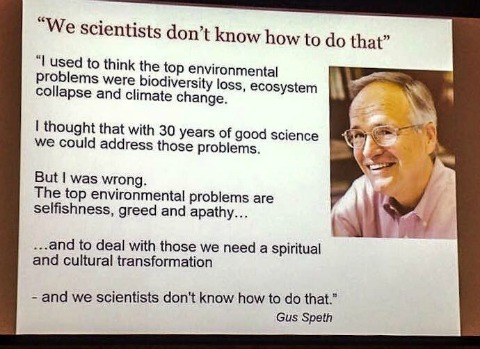 But as Gus Speth said, scientists do not know how to solve the problems facing humanity and our planet. It might just be up to the Metaphysicians. What do you think? Metaphysicians can be found in all walks of life - teachers, professionals, construction workers, stay at home moms, small business owners. By applying the true nature of reality to our work, our homes, our relationships, our government... maybe?